Liam is a very happy little boy that is loved by everyone that meets him. He was born in October 2011 and apart from being diagnosed with hearing loss at birth Liam was otherwise healthy. By 6 months old Liam had not gained a lot of weight, we were sent for some tests for ‘failure to thrive’ and by 8 months old we were diagnosed with PBD. Since then life has been a whirlwind. 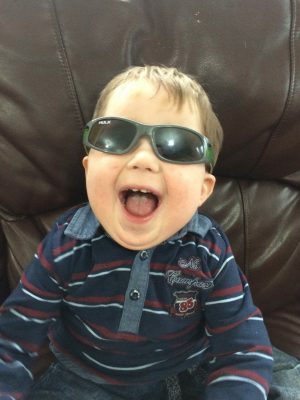 Liam is non-verbal but can communicate really well, he reluctantly wears hearing aids, walks with his kaye walker and overall loves to be very independent. He attends our local pre-school (on reduced hours) 3 mornings a week and loves every minute of it. We attend a lot of medical appointments but Liam has everyone wrapped around his little finger especially the nurses in our local hospital outpatient department!